All news items on our website. 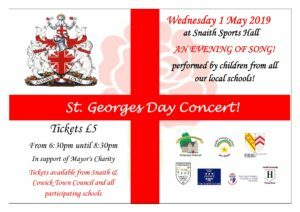 Our event to celebrate St. George’s Day 2019 involves children from all our local schools coming together to offer us ‘An Evening of Song!‘ Children from 7 schools will sing a variety of songs both individually and as a combined group, culminating in Land of Hope and Glory to mark the occasion! Tickets are £5 and will include free entry into a raffle prize draw. 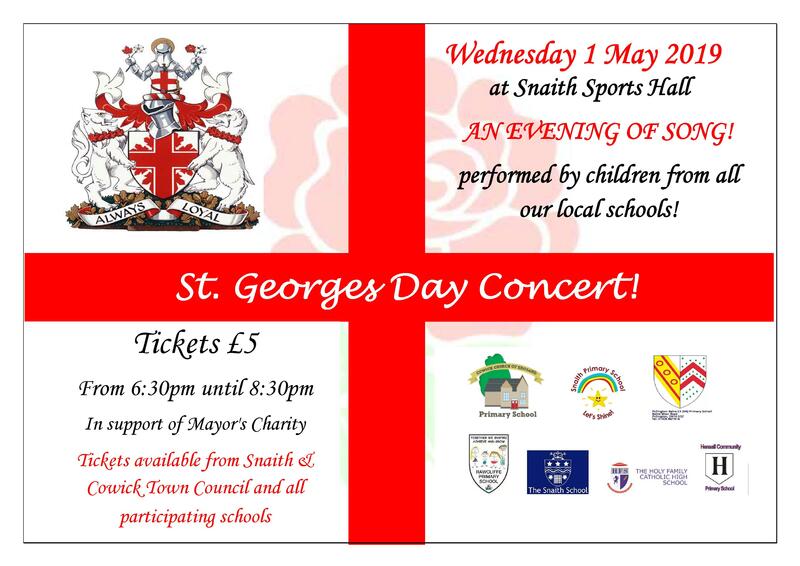 Tickets can be purchased from participating schools and from the Town Council office. All monies raised will go towards the Mayor’s Charities for 2019, which are Guide Dogs for the Blind and The Priory Church Roof Repairs Fund. Please see the latest Newsletter from Humberside Police which covers the Snaith, Rawcliffe, Airmyn and The Marshlands area. This report now includes specific issues that are affecting our parish and an update from the police as to how they are tackling them. Please click on the link below to download the document. The Town Council have recent applied to join an initiative with Humberside Police who are giving parishes the opportunity to have Community speed cameras. We know speeding on our roads is a concern for many and Community Speed Watch will allow residents to become police-trained volunteers monitoring vehicle speeds in their communities. The aim is to change the behaviours of some road users and anyone found speeding will receive a warning letter. This follows a successful pilot scheme in North Lincolnshire last year. We are therefore looking for SIX volunteers from the parish who would be willing to support the Town Council in this initiative. 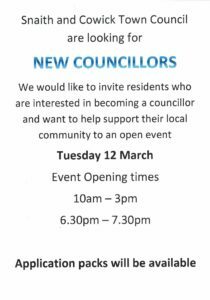 If this is something you would be happy to be a part of, please contact us on 01405 862663 or via e-mail at either vicky.snaithcouncil@hotmail.com or nicola.snaithcouncil@hotmail.com. ARE YOU INTERESTED IN BECOMING A TOWN COUNCILLOR? 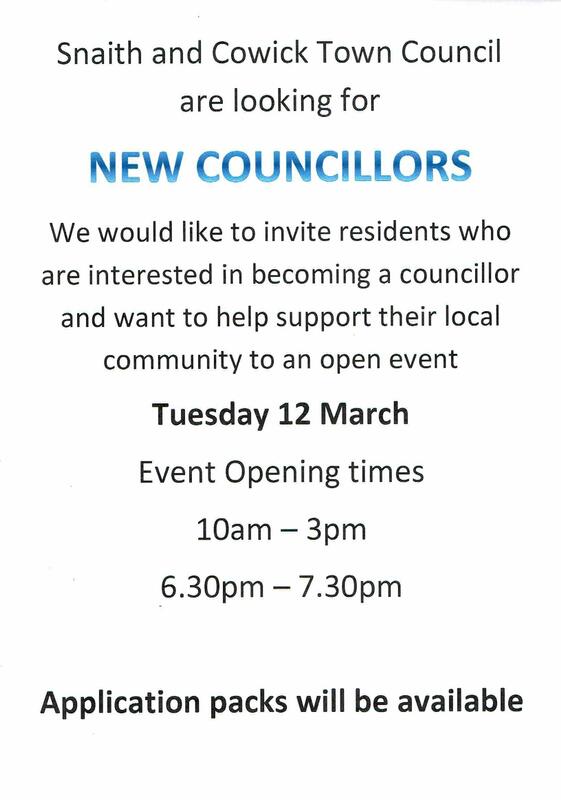 If so, we are asking residents who are interested in supporting their community to come along to an open event where you can find out more about what the role involves, talk to council staff and see what work is currently being done within the parish. A number of current councillors will be available to answer any questions you may have. Application packs will also be available on the day. If you are keen to find out more but are unable to attend, please call either Vicky or Nicola at the council office on 01405 862663 who will be able to help you. Can you please spare 1 hour to help support your local community? 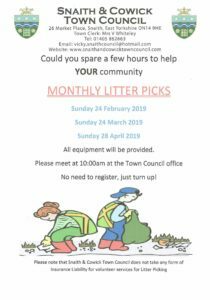 The Town Council are continuing to hold monthly litter picks, the next one being SUNDAY 24 FEBRUARY at 10:00am. 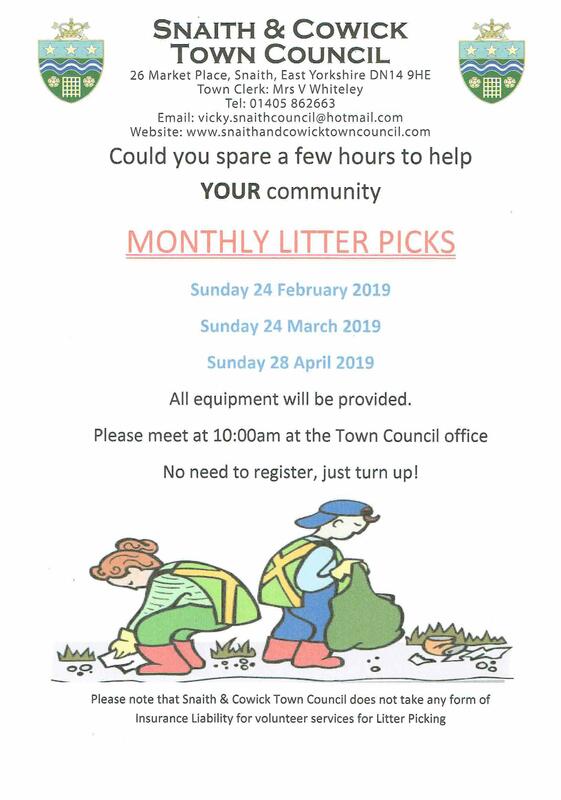 No need to book, please just turn up at the council office and help keep Snaith and Cowick looking tidy. All equipment will be provided. Snaith & Cowick Together is a local community group who were established 15 years ago and have since been instrumental in setting up new clubs and carrying out a variety of projects within Snaith and Cowick. They are now looking for more volunteers to help the group continue to operate. 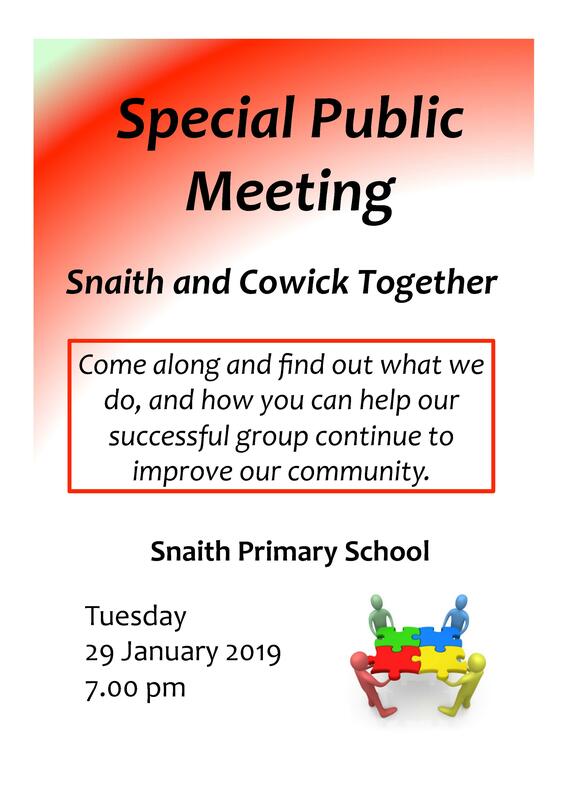 If you would like to become involved, please come along to this meeting to find out more information. Concerns over Anti-Social Behaviour? 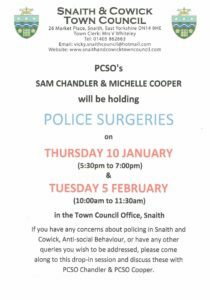 Questions on Policing in Snaith and Cowick? Police Drop-in Sessions at the Town Council office at 26 Market Place, Snaith. 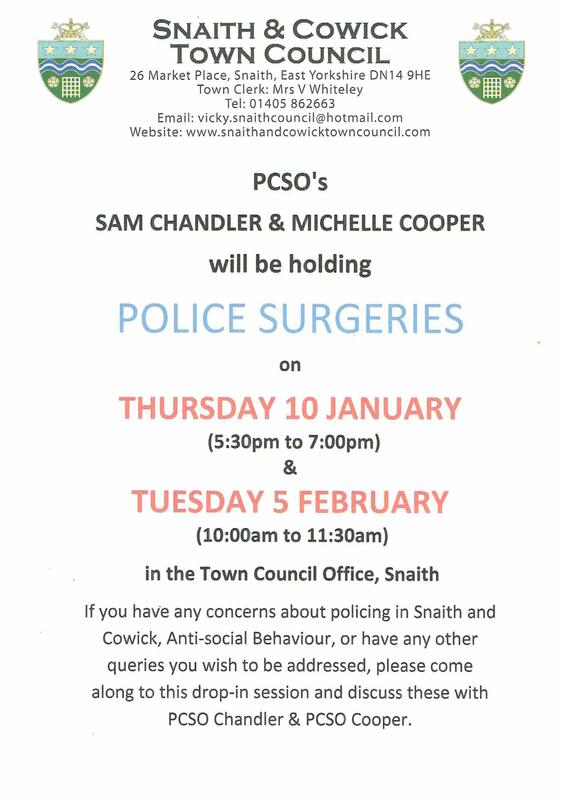 If you have any issues with policing in Snaith and Cowick or would like to discuss any other issues such as anti-social behaviour, please come along to these drop-in sessions hosted by your local PCSO’s Sam Chandler and Michelle Cooper who will hopefully be able to answer any queries you have.